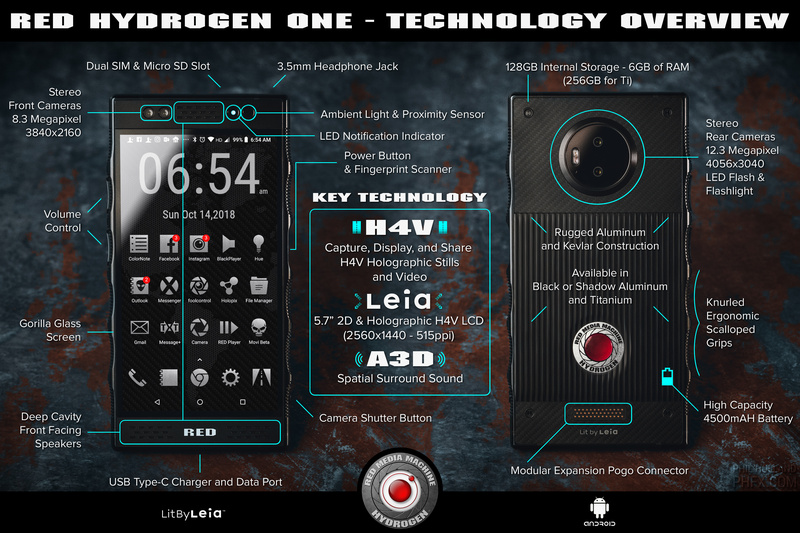 The RED Hydrogen One is a smartphone unicorn of sorts – it made some cool promises at its launch, but as it comes to terms with reality it finds itself unable to make good on them. And while we wait to see if it’s going to actually go in mass production or not, here’s a cool infographic from the company explaining some of its key specs. Obviously, the centerpiece of the Hydrogen One are the cameras – you can find two of them on the front and two on the back. The front ones offer 8.3MP resolution while the back ones are 12.3MP but unlike most multiple-camera smartphones, the Hydrogen One takes a slightly different approach at photography and cinematography. The cameras are able to record and take H4V holographic videos and images, which can be later displayed by the H4V-capable 5.7-inch LCD panel with QHD (1440×2560) resolution. We’d love to see how that works in real-life, although the more time passes the higher the chance that we may never get to.